Accelerated bridge construction techniques, warm-mix asphalt and adaptive signal control technology are among the innovations state highway agencies plan to use on the latest round of Highways for LIFE demonstration projects. The Federal Highway Administration awarded nearly $20 million for 17 new projects in as many states. Fifteen projects—in Arkansas, Colorado, Connecticut, Georgia, Idaho, Kansas, Maryland, Minnesota, New Hampshire, New Jersey, New York, South Carolina, Utah, Vermont and Wyoming—will receive Highways for LIFE monetary incentives. Two other projects—in Ohio and Rhode Island—will receive a waiver of the state match incentive. "At a time when states are facing serious budgetary constraints, these grants will help fill a critical need," said FHWA Administrator Victor Mendez. "Investments like these are immediate and long-lasting and will help create jobs." For each project, the state highway agency will set customer-based performance goals and use proven innovations it has never or rarely used to improve safety and quality, speed construction and enhance user satisfaction. 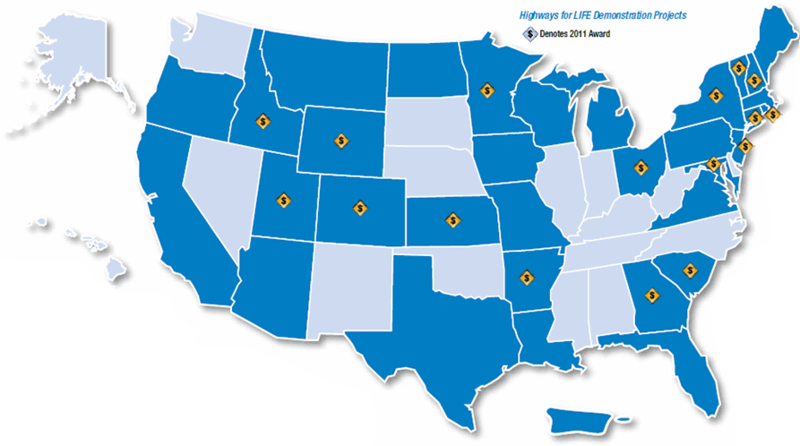 Since 2006, Highways for LIFE has provided incentives for 60 projects in 37 states, the District of Columbia and Puerto Rico. The Arkansas State Highway and Transportation Department will use its grant to fix a section of distressed pavement on Highway 213 in Conway County worn out by heavy truck traffic. The agency will use roller-compacted concrete as an overlay, a more durable and cost-effective alternative to traditional pavement. It also plans to apply a Safety Edge™ treatment to the pavement edge to reduce roadway departure crashes. The Colorado Department of Transportation will use accelerated bridge construction techniques and a new method of project delivery known as construction management/general contracting when it replaces the Pecos Street Bridge over Interstate 70 in Denver. That's expected to limit the impact of the project on the traveling public to 50 hours versus the 12 months it would take to rebuild the bridge using conventional methods. A new roundabout interchange will enhance safety and capacity. Warm-mix asphalt with polymer-modified binder will be used to improve durability and rut resistance when the Connecticut DOT refurbishes a high-volume section of I-95 in Guilford. Warm-mix asphalt, produced at lower temperatures than hot-mix asphalt, also saves energy. The agency will try the Safety Edge technique for the first time to improve roadway safety and the durability of the pavement edge. When the Georgia DOT rehabilitates pavement in historic downtown Winder, it will use precast concrete pavement systems to reduce construction impact on traffic and enhance safety for motorists and workers. Using precast panels, cast off site and quickly installed at night, will allow the street to be opened to pedestrians and vehicles during the day. Improved user satisfaction is expected because of faster construction, longer pavement life and fewer future repairs. The Idaho Transportation Department will replace a bridge over the East Fork of the Salmon River in Custer County entirely with precast concrete bridge elements. Construction time is limited at this remote location because of weather, and using precast elements will eliminate at least one construction season and one winter shutdown compared to conventional construction, as well as improve safety and quality. In its first major work zone ITS project, the Kansas DOT will use real-time traffic data to advise travelers on traffic conditions in the vicinity of I-35 interchange construction in Johnson County. That will enable motorists to choose an alternate route before entering the work zone and enhance safety. It will also allow the highway agency to document the benefits of work zone ITS systems for possible use on future projects. In a bridge project, the Maryland State Highway Administration will use self-propelled modular transporters to move two prefabricated superstructures built in the median into place over Maryland 295 in Anne Arundel County during a single weekend road closure of 34 hours. Using conventional construction techniques would involve more than a year's worth of traffic disruption. Self-propelled modular transporters will also be used on a Minnesota project to replace a bridge over I-35 in St. Paul over a weekend. Using this technology will enable the Minnesota DOT to reduce the project's impact on interstate traffic by 75 percent compared to conventional construction, as well as enhance safety and user satisfaction. The New Hampshire DOT plans to include several innovations it has never tried before on a resurfacing project on NH Route 101 in Rockingham County to extend pavement life and reduce the need for future repairs. They include using reclaimed asphalt pavement, warm-mix asphalt, an asphalt-rubber wearing surface mixture and a high-polymer modified asphalt wearing surface. The agency will use a Safety Edge treatment to minimize roadway departure crashes and smart work zone techniques to improve safety on the job. To improve traffic flow and enhance safety, the New Jersey DOT will install an adaptive signal control system on a high-traffic section of NJ 28 in Somerset County. The system is designed to ease congestion caused by poor coordination of the 10 signalized intersections in the corridor. Adaptive signal control technology adjusts the timing of lights to accommodate changing traffic patterns. The New York State DOT will disrupt traffic for two weekends rather than two construction seasons when it replaces two bridges on I-84 in Putnam County near the New York-Connecticut border. Accelerated bridge construction techniques planned for the project include rolling prefabricated bridge superstructures into place over the weekend. The project will also use super-high-performance concrete and stainless steel reinforcement to enhance durability. To minimize disruption to motorists, the Ohio DOT will use precast concrete pavement systems when it restores a section of distressed pavement on U.S. 35 in Dayton. The precast panels will be installed using temporary lane closures during off-peak travel hours on this major thoroughfare through the city. Precasting is done in a controlled environment, resulting in improved quality. The Rhode Island DOT will use all prefabricated substructure elements, geosynthetic reinforced soil embankments, a prefabricated superstructure and a self-propelled modular transporter to speed replacement of the East Shore Expressway Bridge in Providence. These accelerated bridge construction techniques will reduce roadway closure time to one weekend on the project, which the agency hopes to use as a model for future bridge projects in the short- to medium-span range. Precast concrete pavement systems will help the South Carolina DOT reconstruct a section of SC 773 in Newberry with minimal impact on local businesses and traffic. Using precast panels that are thinner than conventional pavement but still structurally adequate will eliminate the need to raise overpasses along the route to achieve sufficient clearance for traffic. The Utah DOT will try geosynthetic reinforced soil integrated bridge system technology on a project to replace twin bridges that carry I-84 over a road in Salt Lake City. The technology uses alternating layers of compacted granular fill material and fabric sheets of geotextile reinforcement to provide support for the bridge. It reduces construction time and cost and contributes to the durability and quality of the bridge. The Vermont Transportation Agency will combine the use of warm-mix asphalt, the Safety Edge and intelligent compaction on a paving project in Rutland County. The application of warm-mix asphalt and intelligent compaction is expected to produce a higher quality pavement, while the Safety Edge is designed to reduce roadway departure crashes. Reworking the I-25/College Drive interchange near Cheyenne to a diverging diamond design will enable the Wyoming DOT to reduce congestion caused by slow-moving trucks and increase pedestrian and vehicular safety. The project, expected to cut the crash rate at the interchange by 40 percent, involves converting a conventional diamond interchange to the new design with minor structure alterations, ramp realignment and lighting. Successful innovation deployment in the transportation world requires creating a new mindset among stakeholders, Byron Lord, Highways for LIFE team leader for the Federal Highway Administration, told participants in a workshop on "Innovation in U.S. Transportation Design and Construction: How to Make It Work." The workshop was part of TransOvation, an innovation-focused conference sponsored by the American Road & Transportation Builders Association that drew about 100 participants to Leesburg, Va. Workshop speakers from private industry and public agencies provided a taste of how innovation is changing highway construction. 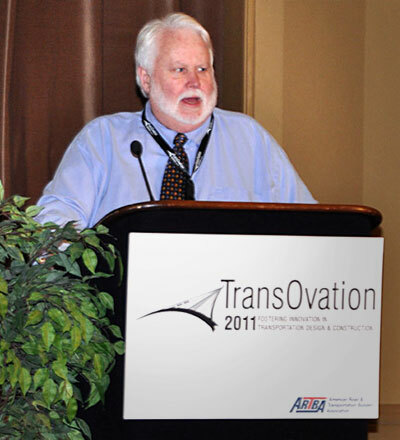 Becoming innovative involves creating a new mindset in the highway community, Highways for LIFE Team Leader Byron Lord told TransOvation workshop participants. Innovation is the doorway to opportunity for the transportation community, said Lord, who moderated the event. It's important because of the growing demands on the nation's transportation infrastructure, the need to restore infrastructure condition, funding challenges and high customer expectations. "We're talking about creating a different culture, a new set of values," he said. "It's about recognizing the best solutions and working to implement them. If we're going to be successful in deploying innovation, we must be successful in creating a new mindset." The second Strategic Highway Research Program, commonly known as SHRP 2, is a collaborative effort to implement the results of research to advance highway performance and safety for highway users, according to Jim McMinimee, SHRP 2 coordinator for the American Association of State Highway and Transportation Officials. The program conducted $200 million in strategic research to generate innovative methods and tools in the areas of rapid infrastructure renewal, safety, reliability and capacity. "We're now transitioning from research to implementation," said McMinimee, a multiyear effort to deliver 130 technology, process and information technology products, standards and specifications. FHWA, the Transportation Research Board and the National Highway Traffic Safety Administration are also participating in SHRP 2. The "bridge-in-a-backpack," a hybrid bridge system that combines the benefits of high-performance composites with the durability and cost-savings of cast-in-place concrete, is undergoing commercialization after several successful test projects. The system uses inflatable stay-in-place tube forms that are filled with concrete and used as arches to support the bridge. "The system eliminates the need for rebar installation in the superstructure and enhances concrete performance for safety and structural redundancy," said Barry Raeburn, executive vice president of Advanced Infrastructure Technologies. It also offers rapid design, fabrication and delivery and a reduced carbon footprint. It was named a 2011 focus technology by the AASHTO Technology Implementation Group. "Innovation is the key to our success," said Tom Hessling, national practice leader for alternative project delivery for ARCADIS. The firm uses alternative project delivery approaches such as design-build and construction-management-at-risk to deliver projects faster and more economically, with a focus on "time-saving technologies and construction techniques that fit into the norms at state highway agencies," he said. He cited major U.S. projects on which the firm used innovation: the Milwaukee Marquette interchange in Wisconsin, the New York I-87 and I-287 interchange, Minnesota's Trunk Highway 212 and the New York Tappan Zee Bridge rehabilitation. Dave George, worldwide strategic account manager for Trimble, discussed how positioning technologies—including global positioning system, laser and optical—are transforming work processes. Installing grade control systems on bulldozers, excavators and pavers, for example, can cut fuel costs and reduce wear and tear on the machines. "This can have a significant impact on users' economics and capabilities," George said. Dr. Bob Edelstein, ITS practice leader for AECOM, talked about barriers to innovation in transportation operations, such as institutional barriers, different agency priorities, inadequate funding for operations and maintenance, and reactive traffic management. Strategies being applied to overcome those barriers include proactive transportation operations, integrated corridor management, high-occupancy toll lanes and active traffic demand management. Edelstein summarized three ingredients for future success: "We need a regional approach to transportation operations. We need better tools for predictive modeling to make decision support systems more efficient. And we need a user-oriented approach to multimodal solutions." Accelerated bridge construction methods will slash traffic interference time to about two weeks on a rural Iowa bridge carrying U.S. 6 across Keg Creek in Pottawattamie County. The $2.7 million reconstruction project is a cooperative effort involving the Federal Highway Administration, the Iowa Department of Transportation and the second Strategic Highway Research Program to demonstrate the latest advances in accelerated bridge construction methods. For its innovations, the project received an FHWA Highways for LIFE grant. The existing 180-by-28-foot (54.8-by-8.5-meter) continuous concrete girder bridge was built in 1953 and is classified as structurally deficient. The new bridge will increase the structural capacity of the crossing, improve roadway conditions and enhance safety by providing a wider roadway. What's more, construction zone safety will be improved through the use of prefabricated components, which minimize traffic interference time. It's estimated that conventional cast-in-place methods would require six months of construction time. 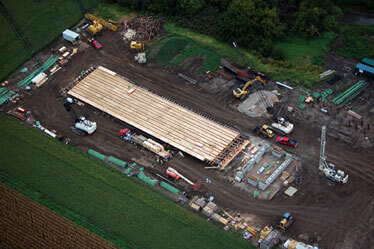 Iowa's Keg Creek Bridge was completely prefabricated in separate components in a field next to the bridge site. Components of the three-span bridge will be prefabricated, according to Ahmad Abu-Hawash, chief structural engineer for the Iowa DOT. They include the modular precast concrete deck and steel beam superstructure units. Each precast deck module will be supported by and joined to two rolled steel girders that reach across one span of the bridge. Abutment caps and wing walls will be precast concrete, as will pier caps and pier columns. Abu-Hawash said high-performance concrete will be used in all precast components. HPC has higher durability, lower permeability and potentially greater strength than conventional concrete. And ultra-high-performance concrete will be used in the joints between the modular superstructure units. In past projects, a longitudinal superstructure joint consisting of UHPC material was developed and tested by the New York State Department of Transportation to provide a durable, moment-resisting (rotation-resisting) joint between deck panels. The Iowa project is the first in the United States to use UHPC to provide a full, moment-resisting transverse joint at the piers. This detail will allow the superstructure elements to be erected as a simple span. Once the UHPC joints are constructed, they will perform as continuous joints. The bridge will have a basic structural health monitoring system, said Abu-Hawash. Sensors will be installed at key points in the bridge to help evaluate and document the innovative aspects of accelerated construction. Self-consolidating concrete, a highly flowable concrete that spreads into place without mechanical consolidation, will be used to speed abutment pile construction. Abutments will consist of prismatic, precast concrete elements that feature a series of open holes to accommodate driven steel H-piles. Another innovation will be fully contained flooded backfill. This proven construction method involves placing a granular wedge behind the abutment backwall, then flooding the granular backfill with water. As a result, the granular backfill achieves early consolidation and the potential for void formation beneath the approaches is reduced. All of the technologies incorporated in the bridge's construction have been used in constructed projects drawn from around the nation—so the resulting structure and methods are not new ideas, but instead leverage previously successful work. The winning contractor, Godbersen-Smith Construction Co. of Ida Grove, Iowa, planned to close the existing bridge for two weeks in October while the new structure was erected in place. Plans called for prefabricated components built in a casting yard next to the bridge construction site to be lifted into place by construction cranes. One of the last steps, said Abu-Hawash, is casting the joints between the deck modules using UHPC. 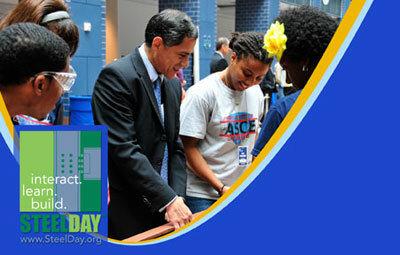 Federal Highway Administrator Victor Mendez stepped in to help Howard University engineering students erect their steel bridge model at the SteelDay event at FHWA's Washington, D.C., headquarters. It was one of more than 200 SteelDay events around the country featuring the steel industry's latest innovations in action. At the FHWA-hosted event, teams from Howard and Virginia Tech Universities showed off their entries in an American Society of Civil Engineers' competition to design and construct scaled-down steel bridges. Using innovation and accelerated construction techniques enabled the Maryland State Highway Administration to replace two bridges on bus routes while school was out for the summer and save money in the process. The project, which received a Highways for LIFE grant for its innovation, used prefabricated bridge elements, incentive contracting and full road closures with detours to speed construction. As a result, the job was done in three months, two of which involved summertime full road closures, instead of the 15 months required for traditional construction techniques, according to a Federal Highway Administration report on the project, Bridge Replacement on MD 28 and MD 450, Frederick County and Anne Arundel County, Maryland. An economic analysis found that the innovative project saved about $1.49 million, or 32 percent, over the cost of a similar project using conventional construction practices. A significant amount of the cost savings was reduced safety costs resulting from the use of full road closure—an approach designed to eliminate the exposure of motorists to work zones and workers to traffic by temporarily closing a road for rehabilitation or maintenance. Highway agencies have found that full road closures are an effective way to expedite delivery of projects, including another Highways for LIFE project to reconstruct part of Trunk Highway 36 in North St. Paul, Minn.
Precast slabs and other innovations helped the Maryland SHA cut construction time and enhance quality on a bridge replacement project. "This project achieved a high level of quality and was brought to completion quickly and safely as a direct result of innovative contracting and construction methods," the report said. "Many of the innovations employed were validated as a result of the many experiences gained through this project." No motorist incidents or worker injuries were reported at either site during construction, which means the project exceeded the Highways for LIFE goals for motorist and worker safety. Over time, the project is expected to meet the goal of a 20 percent reduction in motorist fatalities and injuries, both because of the use of safer, more durable bridge surfaces and less need to access the bridges for future maintenance. The most significant measure of quality improvement for the two 80-year-old, structurally deficient bridges was the visible improvement in structural adequacy and maintainability. Precast, prestressed portland cement concrete slabs fabricated off site and shipped to the project sites provided a high-quality road surface and diminished need for future maintenance of the replaced structures. To minimize both project costs and variability in quality and process, the project involved a single contract awarded to one low bidder to build both bridges concurrently. Prompt completion was assured by incentive and disincentive clauses for on-schedule performance. Contract administration, however, was a challenge for the Maryland SHA because the project sites were located in different districts. In the future, according to the project report, the agency may assign one district to manage combined projects. The agency realized many benefits from the use of full road closures, including increased safety and decreased construction and curing time for major construction. "Any time you can construct a project with a detour in place, it is a benefit," said Jeff Robert of the Maryland SHA. "This creates a safer situation for construction workers and the traveling public and allows the work to be done quicker." Because of the construction time savings generated by the use of prefabricated superstructure elements, the agency is investigating the use of precast substructure elements to further minimize construction time and traffic impacts on future projects. "These projects performed within the Highways for LIFE program served as effective stepping-stones to better, more efficient construction methods," the report said. To read the Maryland, Minnesota and other technical reports on Highways for LIFE demonstration projects, go to www.fhwa.dot.gov/hfl/projects. The need for robust, easy-to-construct connections between prefabricated bridge components has hindered the use of this technology, but ultra-high-performance concrete can simplify connection details while producing a durable system. Speakers explained how during a Web conference, "Field-Cast Ultra-High-Performance Concrete Connections for Prefabricated Bridge Elements and Systems," part of the free "Innovation" series sponsored by Highways for LIFE and the National Highway Institute. "There has been a big push recently to use PBES, and it does provide a lot of benefits," said Ben Graybeal, structural concrete research program manager at the Federal Highway Administration's Turner-Fairbank Highway Research Center. Using PBES accelerates construction, increases worker and driver safety, and produces high-quality finished products. But PBES also presents challenges, the biggest of which is connecting the components. "The connections need to be strong and durable," Graybeal said. "You don't want to be coming back and fixing those connections in the near term." UHPC, a fiber-reinforced cementitious composite material with mechanical and durability properties that exceed those of traditional concrete, is an emerging technology that addresses the connection challenge. "It has properties well beyond what you would normally expect for concrete, such as high strength and stiffness," Graybeal said. "It has very good durability. It has internal steel fiber reinforcement for added ductility. It's also self-consolidating, so it's good for applications where you have to go into tight locations." Graybeal discussed bridge projects on which UHPC has been used to make connections between components, including connections between conventional concrete bridge deck panels, deck bulb-tee girders and box beams. It also will be used on a project that has received a Technology Partnerships grant from the Highways for LIFE program to connect modular bridge deck panels made of UHPC. Vic Perry, Lafarge North America vice president and general manager for the Ductal® product line, outlined practical considerations for using UHPC, including mixing, field testing and quality control. He also discussed projects on which his company's UHPC products have been used. "We have progressed over the past few years from simple joint fills to more extensive use of UHPC in field-cast connections in all types and parts of the bridge," Perry said. As the use of accelerated bridge construction techniques becomes more prevalent, he said, the early strength properties of UHPC will be valuable to highway agencies striving to complete construction projects and open bridges to traffic quickly. "Early strength is critical to provide a high-quality, durable bridge and also minimize traffic disruption," Perry said. "Highway authorities and users both want durability and minimum disruption while replacing or working on a bridge.". For a recording of the web conference, visit www.fhwa.dot.gov/hfl/resources/#webinar. 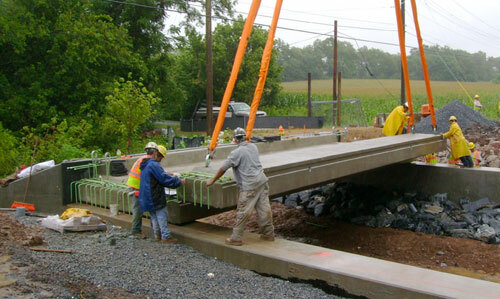 To learn more about field-cast UHPC connections for modular bridge deck elements, see www.fhwa.dot.gov/publications/research/infrastructure/structures/11022/11022.pdf. For more information on UHPC, see www.fhwa.dot.gov/publications/research/infrastructure/structures/11038/11038.pdf. Innovator, published by the FHWA Highways for LIFE program, advances implementation of innovative technologies and processes in the highway industry. Its audience is transportation professionals in highway agencies, trade and research groups, academia and the private sector, and the driving public.